(NaturalNews) Oregon Health and Science University is now looking for volunteers to try out a new and apparently "promising" HIV vaccine, as reported by Inquisitr. The novel vaccine could be "a huge step forward in the fight against HIV, as well as give the Oregon school the confidence and research it needs to pursue vaccinations against other deadly infections." In the US, more than 1.2 million people are living with HIV and almost one in eight are completely unaware of their infection. Over the past decade, the number of people living with HIV has increased, and the pace of new infections is far too high, according to the Centers for Disease Control and Prevention. However, the vaccine from Oregon University is troubling, as it is based upon a live (but weakened) version of cytomegalovirus (herpes virus) – that has been genetically engineered to appear like HIV to the human immune system. 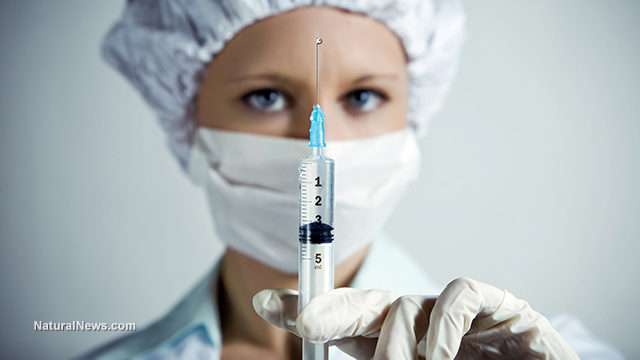 Wait a minute – so not only is it yet another vaccine, but it's a GE vaccine to boot? As reported by Natural Blaze, vaccines are not always effective. We have seen outbreaks of infectious disease spread widely amongst fully vaccinated individuals and new viral strains are frequently appearing that escape current immunization. Meanwhile, diseases such as autism have been linked to childhood vaccination. There are rising rates of autism and neurological disorders in large percentages of children that are considered by researchers to be linked to vaccinations. In fact, there is a growing body of research that points to the adverse effects of vaccination on our immune systems, meaning that there needs to be a serious review of official claims over vaccine safety and efficiency, as reported by Natural Blaze. The "breakthrough" in Oregon is being reported as curing 50-60% of HIV-infected monkeys, and now the university is calling for human guinea pigs so that the study can be conducted with people. According to the head researcher, scientists "aren't 100% sure why they have been unable to improve upon that cure rate [of 50-60%]." So basically, what they're saying is that they have a vaccine with a 50/50 chance of success, that's been genetically engineered and they want to test it out on humans... right. GE foods have already been declared unsafe and according to USRTK, there has not been enough long-term testing as to whether or not GE products are safe for humans. When it comes to GE food, the FDA has stated that "it is the manufacturer's responsibility to ensure that the [GE] food products it offers for sale are safe." That's pretty worrying. The FDA does not require independent pre-market safety testing for GE food and it also does not require the companies to submit full and complete information about these studies. Does that mean that it's up to the vaccine manufacturer and Big Pharma to decide whether or not their GE vaccines are safe? Most of the animal safety testing that takes place with GE food and vaccines is merely short-term, as with the monkeys and the HIV vaccine. This means that no studies have been carried out over the lifespan of a human being. There is no way to determine whether or not the HIV vaccine is safe to humans over the course of 80 or so years – and the vaccine is only 50% effective in monkeys. So who would want to take that chance? Big Pharma is starting to manipulate nature to a whole new level by using GE in conjunction with vaccination – independently those two things have been proven to be dangerous to human health. But combined? The new HIV vaccine could in fact be lethal.